Educators from The University of Notre Dame get sporty with some Street Games participants. A NEW Street Game initiative wants to connect all member of the community through sport and art. 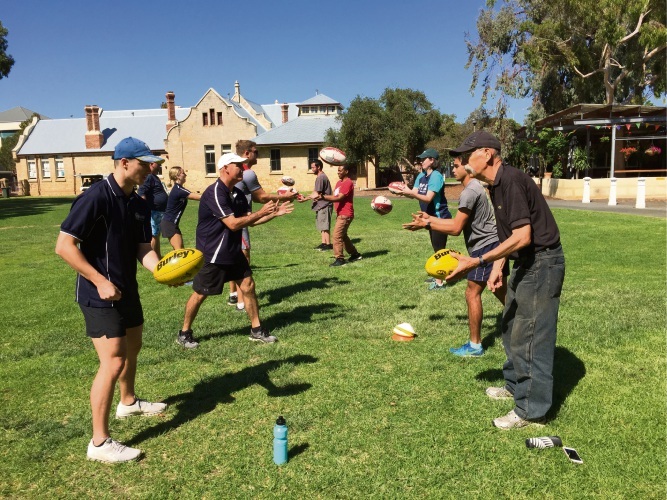 St. Patrick’s Community Support Centre has joined with the City of the Fremantle, University of Notre Dame and the Stephen Michael Foundation in Reclink Australia’s new Street Game initiative. Every Wednesday people from all walks of life can join in football, boxing and cricket in Fremantle. St Pats chief executive Michael Piu said it had been fantastic for the clients. “It’s not just the physical health benefits, it’s the engagement in the broader community and the sheer enjoyment that’s wonderful to see,” he said. “Our Street to Home programme has been instrumental in getting this project off the ground and encouraging clients to join in. “Some of these clients have had very tough times over the last year so to see the smiles on their faces when kicking the footy around is very special. Reclink state manager Michelle Duffield said she was thrilled to see so many people joining in. “We’ve had people who are experiencing homelessness from St. Pats join us, people with disabilities, people just interested in having a kick, it’s a very inclusive and fun environment,” she said. Street Games runs every Wednesday from 10am to 11.30am at Princess May Park.